A student who had reportedly never played competitive soccer was named on UCLA's elite team alongside members of the U.S. and Canadian national side after her parents allegedly transferred Facebook shares worth $250,000 to get her into the school. Lauren Isackson was given jersey No. 41 in 2017 on a team of all star players and required to stay on the side for at least one year, an indictment says. But she made no appearances and played zero minutes during the season after her side included five U.S. youth national players and a member of the Canadian national team, Kennedy Faulknor. Her side finished second to national champions Stanford in the 2017 season. 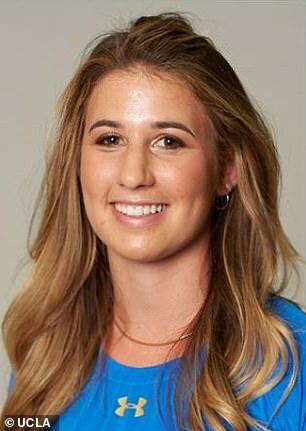 Prosecutors say her parents, Davina, 55, and Bruce, 61, spent more than $600,000 to get Lauren and her sister into UCLA and USC with fake athletic credentials. The California couple are said to have handed over 2,000 Facebook shares - worth around $251,249 - and donations to college admissions scandal mastermind Rick Singer. While her teammates at UCLA were playing for their state or national teams Lauren's roster lists her as team captain for Woodside Soccer Club from 2012-16. She allegedly did not even play competitive soccer before joining UCLA. A spokesman for UCLA told The Los Angeles Times all teams at the school 'include student-athletes with varying levels of athletic achievements'. Jorge Salcedo, UCLA’s men’s soccer coach, is said to have been placed on leave in light of the allegations. He has been indicted on charges of conspiracy to commit racketeering. A profile of Isackson on The Key Athletics Club, one of Singer’s websites, says: 'Lauren Isackson is a standout high school senior at Woodside Priory Catholic School in Portola Valley, California. An affidavit shows Davina thanked Singer 'from the bottom of my heart and soul for your persistence, creativity and commitment towards helping [our daughter]'. A month later the 2,150 shares of Facebook stock worth about $251,249 were allegedly sent to the Key Worldwide Foundation, the nonprofit used by Singer. The money was said to be helping 'disadvantaged youth'. Their second daughter, an equestrian, was reportedly listed as a rowing recruit. Following her test in 2017 they are accused of transferring a further $101,272 to Singer's foundation, the affidavit says. Federal prosecutors say more stocks - valued at nearly $250,000 - were then allegedly sent to Singer's foundation. The couple, who live in Hillsborough, are said to have planned to help their third child into college before the alleged scheme crumbled. Singer is alleged to have called the couple to make the arrangements while his phone was wiretapped by the FBI. Court documents say they spoke of their concerns about the alleged scheme becoming public. According to the affidavit Bruce Isackson was concerned about the alleged payments becoming 'a front page story'. Court documents show he said: 'You know, I am so paranoid about this [expletive] thing you were talking about on the phone. 'I mean, I can't imagine they'd go to the trouble of tapping my phone — but would they tap someone like your phones? According to court documents, Bruce told Singer: 'I think we'll definitely pay cash this time', with regards to their son's admission to college. Davina, 55, appeared at Moakley Federal Courthouse where she was told to not discuss the case with her family unless an attorney is present. She was released on $1 million bond and ordered to surrender her passport. Judge Jennifer C. Boal warned her there is to be 'no discussion of the substance of the case with family members outside of counsel'. She did not enter a plea and refused to speak with reporters as she walked out of court flanked by her attorneys. Both are charged with conspiracy to commit mail and wire fraud and face up to 20 years in federal prison. Bruce, the president of a real estate development firm, is due to appear in court in Boston next week. Rick Singer, 58, pleaded guilty in Boston federal court to running the largest college admissions fraud scam in U.S. history through his small college preparation company in Newport Beach. Over the course of seven years, Singer is estimated to have taken a whopping $25million from wealthy parents to get their kids into elite schools by cheating and bribery. Some 50 people including prominent executives, Hollywood actors and college coaches have been charged for roles in the scheme which saw phony test-takers secure clients' children spots at elite universities including Yale, Georgetown and Stanford. Hollywood actress Lori Loughlin was dropped by the company that owns the Hallmark cable channel and LVMH's Sephora beauty chain ended a sponsorship deal with her daughter, Olivia, as a result of the charge. Loughlin's husband, fashion designer Mossimo Giannulli, has also been charged. Desperate Housewives actor Felicity Huffman was also charged in the scheme. The 56-year-old Desperate Housewives actress deleted her social media accounts on Friday, and pulled down her parenting website, What The Flicka.